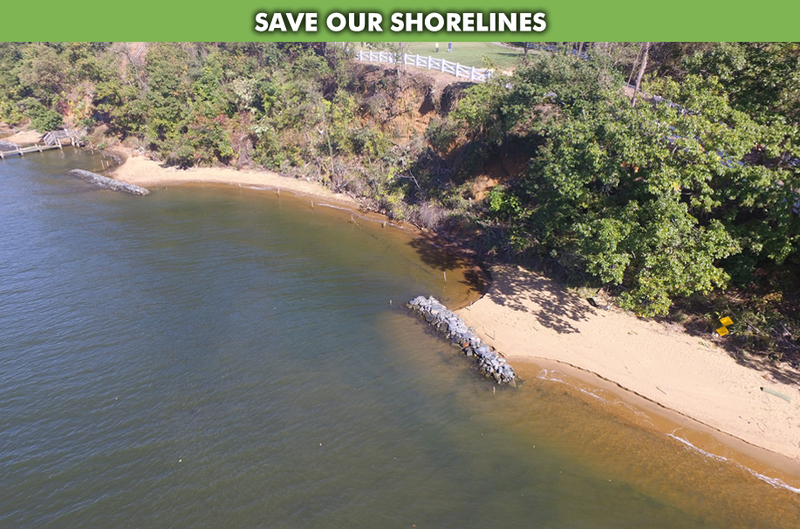 What’s the best way to protect our shorelines, our crimson cliffs, our fisheries, animal habitat, property values and our access and enjoyment of the Severn River? The quick answer is in the picture above. You’re looking at a living shoreline designed to solve typical erosion problem. 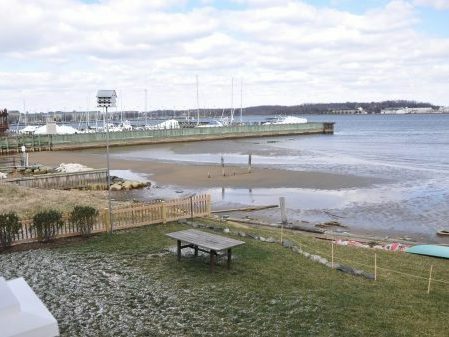 This design is not only protecting that shoreline and cliff from storm and wave energy, but it’s also rebuilding a shoreline that had virtually disappeared due to storm, tide and wave energy. The project above is on the Severn River. It was designed and built by John Flood of Flood Brothers Consulting and it is typical of the new wave of marine designers who understand the science, the techniques and the art of protecting properties, naturally, with living shoreline designs. No sand was imported. It all came from the river bottom just off-shore. Three months before these breakwaters were installed 30 feet offshore, the shoreline was a skinny strip of sand barely reaching past the shade of the trees. At high timed, there was hardly any dry land to walk along the shore. Three months later, the shoreline connects to the rock breakwaters, forming tombolo’s. The breakwaters are simply redirecting wave energy to rebuild the lost shoreline using sand from the river itself. 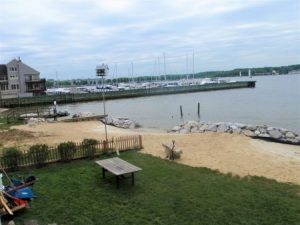 All that open, natural shoreline is habitat for turtles and horeshoe crabs that rely on open shores to lay their eggs to start a new generation on the Severn River. To the right, that’s John Flood just a couple of weeks after installing the breakwater, his feet in the water, explaining how tombolos grow in the lee of his strategically placed breakwaters. Today, he’d be standing well above the water line. 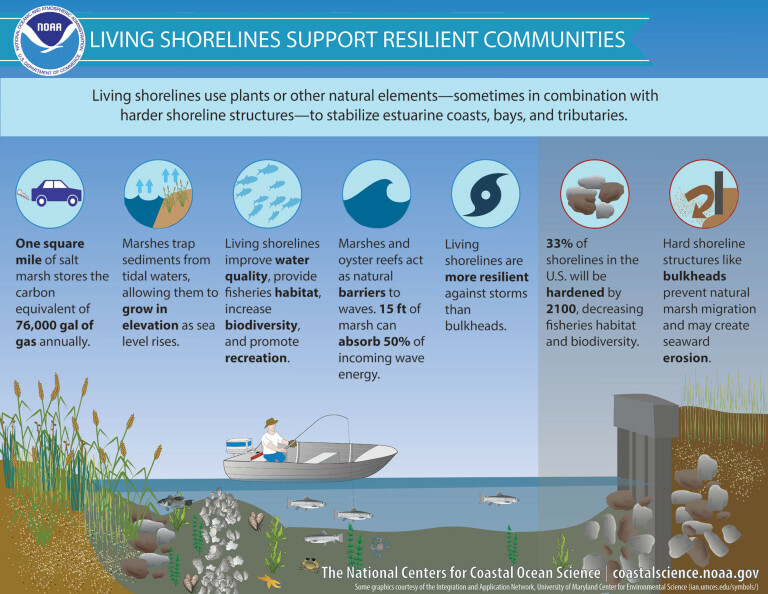 These living shoreline designs, with their low-profile rock breakwaters, are cost-effective ways to protect shorelines, property, cliffs, fisheries, beaches, habitat and ope access to the river. The designs promoted by the new wave of designers are the product of new science and technology mixed in with long-earned experiences that date back to the bulkhead era. The secret in the design is knowing how and where to place these breakwaters so they protect property and encourage natural replenishment of the lost sandy beach. 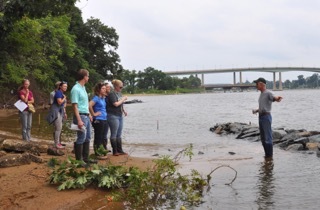 And, by considering a living shoreline as the tool to do battle with Mother Nature, communities are are not only protecting property and shorelines, but they’re protecting our very name, the “Scenic” Severn River. 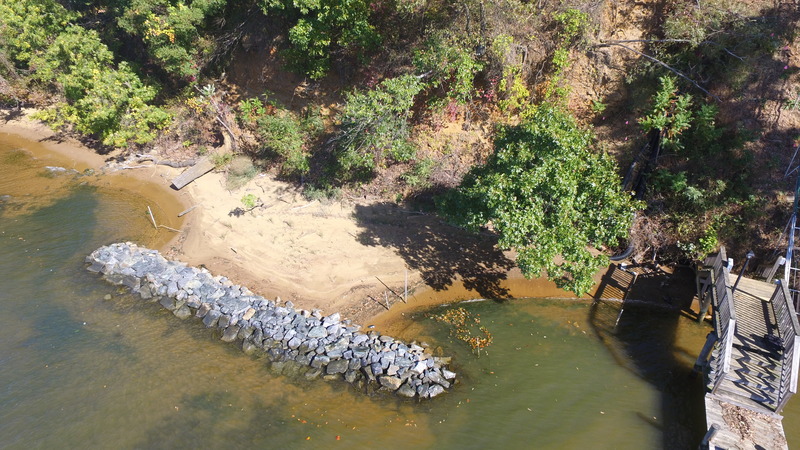 Our river enjoys the “Scenic” designation from the state of Maryland because of our unique crimson cliffs, the abundance of forested areas and the wide array of sandy beaches, marshes and wetlands. These natural features provide rich habitat for wildlife such as kingfishers, turtles, horseshoe crabs, perch, striped bass, crabs, bald eagles, herons, ducks, osprey and oysters. 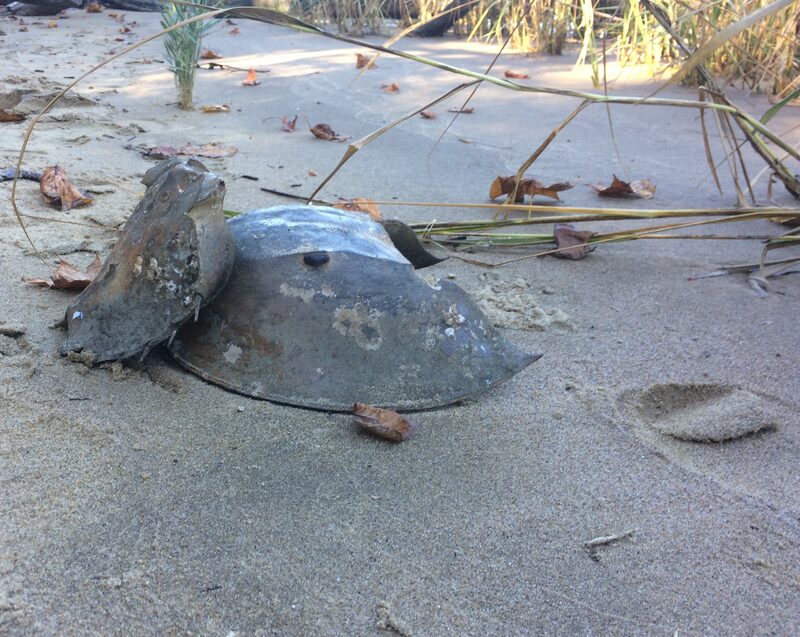 The picture to the left is of two horseshoe crabs who took advantage of the natural shoreline habitat created by a living shoreline John Flood designed and built on the South River. This habitat is just inside the breakwater shown below. For generations, we relied on bulkheads and rock revetments because they were, at the time, the only tools available. But these solutions came with unintended consequences. These “hard” structures damage fisheries and habitat and they can significantly reduce access to the water. There’s science to explain why these hard structures diminish fishers. 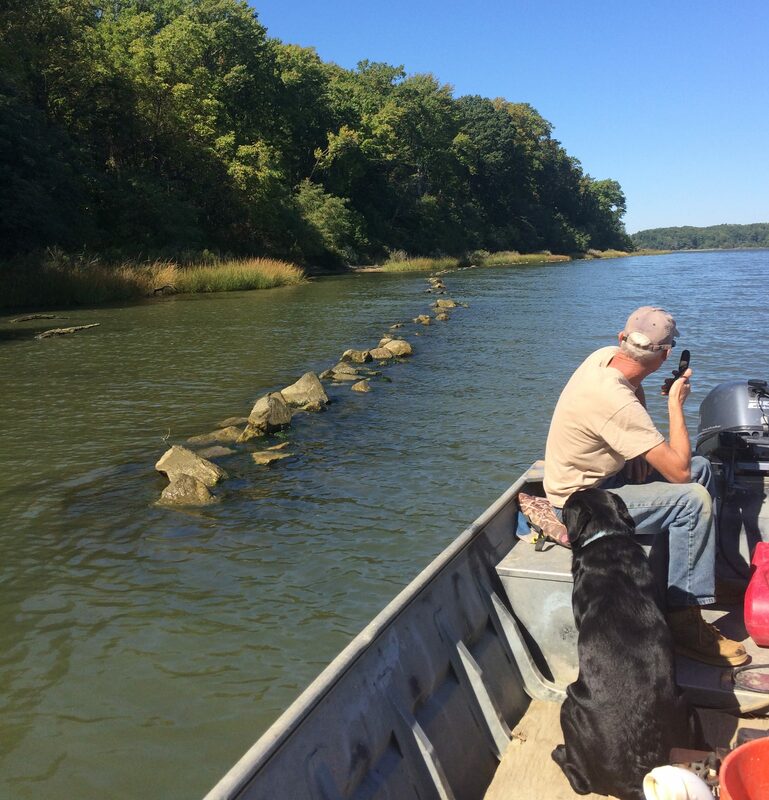 A recent study from the Smithsonian Environmental Research Center (SERC) details what fishermen have long understood, that fish and crabs disappear once bulkheds and revetments are installed. The following graph easily explains the science. There’s a clear reason why the fisherman is on the left side of the river. Fortunately, advances in science and technology, far more cost-effective alternatives to bulkheads and revetments are available. Living shoreline designs create open spaces along a river’s shoreline, mimicking Mother Nature’s natural defenses against erosion. Think of the breakwaters as the reefs that create those serene, calm blue waters around Caribbean and South Pacific Islands. These so-called “soft” living shoreline deisgns rely on a mix of sand, vegetation, grasses to support the strategically placed rock breakwaters that deflect wave energy away from the shore and provide home to wildlife. The SRA’s Save (Y)our Shorelines Tool Kit is designed to raise awareness of these benefits and to offer tools and proofs that living shorelines not only protect property against erosion, but they also improve the Severn River’s water quality, habitat, fisheries and natural beauty..
Plus, living shoreline designs greatly improve enjoyment and use of your shoreline and enhance property values. 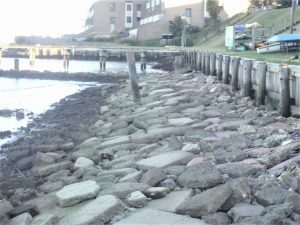 Here’s a proof — a living shoreline project that restored a beach area lost after installation of a bulkhead and rock revetment. 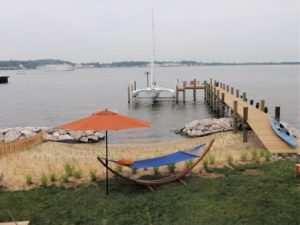 This living shoreline, designed and built by John Flood of Flood Brothers Marine Consultants, is right on the Severn River in the Horn Point area of Eastport. 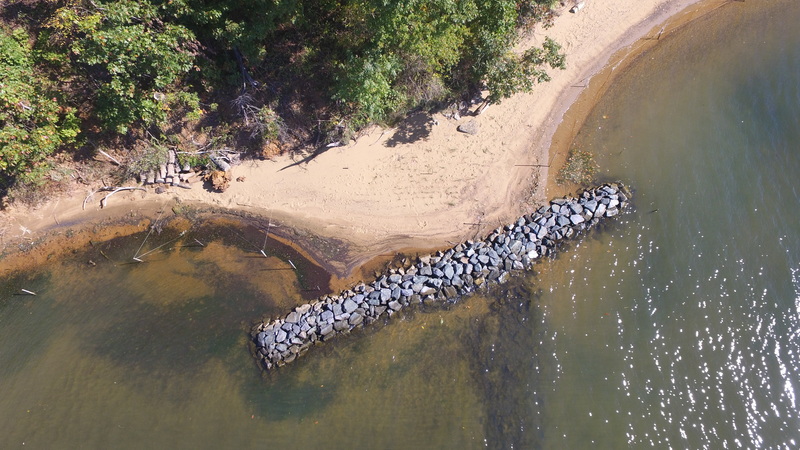 The Maryland Department of Natural Resources (DNR) created a short video to explain the basics of why living shorelines are cost-effective and preferred to bulkheads and rip-rap revetments. 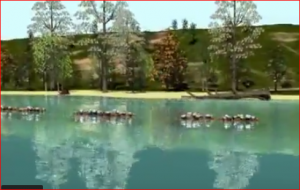 Click here to watch DNR’s living shoreline video. 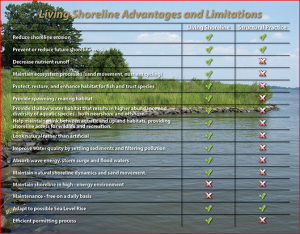 DNR has also published this side-by-side comparison of advantages and limitations of living shorelines vs rip-rap revetments. – resource list of contacts for getting help to create a living shoreline to protect against erosion (i.e. government agencies, lawyers, environmental groups, professionals certified in living shoreline installation, wholesale nurseries, and more).